"Our mission is to provide high quality products in reasonable price." DAPOL s.j. Aldona Dadas Witold Dadas is a family company present on market since 1989. We specialize in imports of fruits and vegetables, and we cooperate with trusted partners. We import our products mainly from Spainas well as Netherlands, Italy, Turkey and Macedonia. Dapol focuses on satisfaction of clients by bringing them highest quality products. 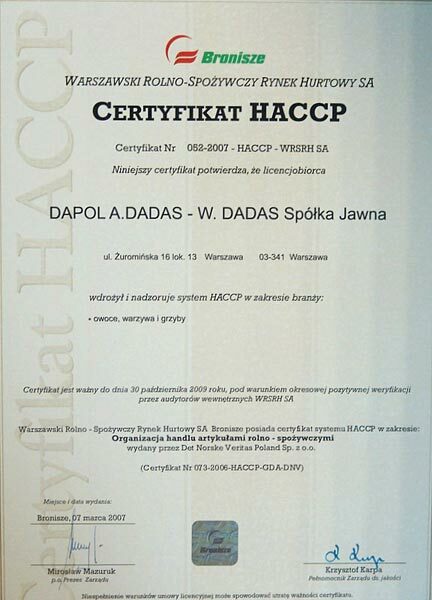 We posses HACCP certificate. Our company is located on the biggest polish wholesale fruit-vegetable market in Bronisze. 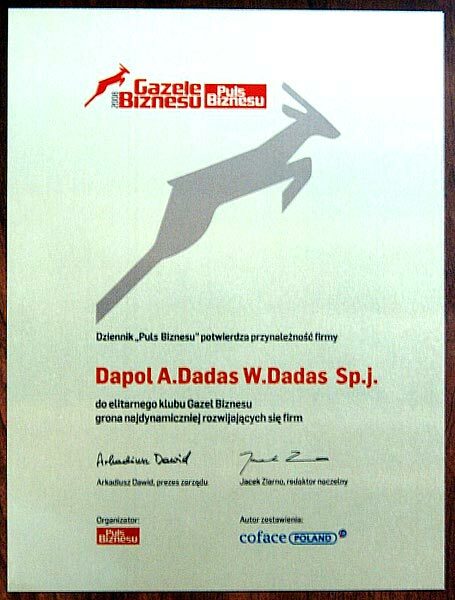 In 2008 we have received prestigious title of "Gazelle of Business" by Economic Journal „Puls Biznesu”, that acknowledges our aspirations as dynamically evolving company.